What happens after the Director/VP level? The career path of FP&A professionals is less standard than that of investment bankers or consultants. 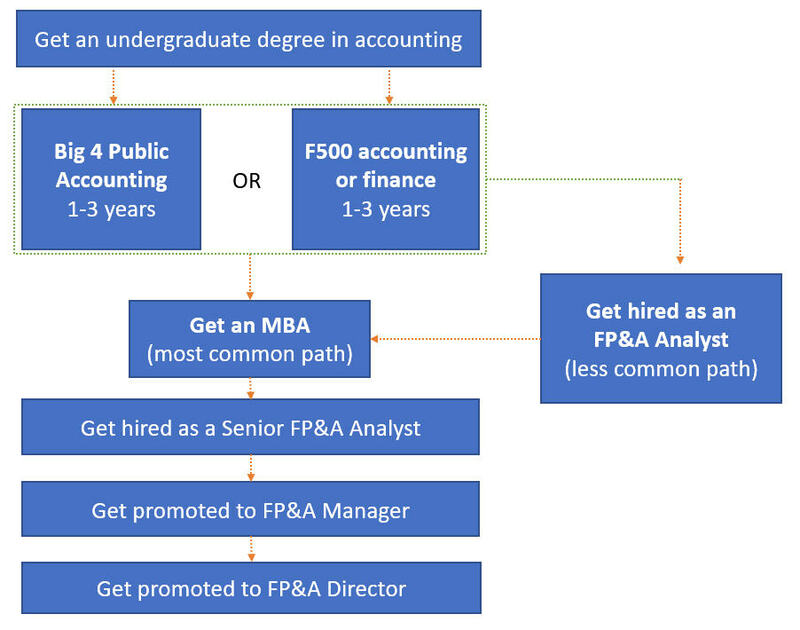 However, if we were asked to summarize a "common" FP&A career path, it would looks something like this: Get an undergraduate degree in accounting, spend 1-3 years in public accounting (big 4) or in accounting/finance at a Fortune 500, get an MBA and then get hired as a Senior FP&A Analyst at a Fortune 1000. To reiterate, this is rough career map and doesn't apply to all industries. For example, the requirement for getting into FP&A within a financial services firm is often a CFA or MBA and the completion of a 2-year bank rotation program. Learn more about the Financial Planning & Analysis job description and responsibilities. The analyst is the workhorse of FP&A. The analyst's primary tasks are data gathering, model building and maintenance as well as coordination across the various stakeholders. FP&A Analyst Salary: $50,000 to $70,000 including bonuses. Experience: The typical candidate will have 1-3 years of experience with an accounting background. Hiring directly out of undergrad is rare, but it does happen at larger organizations. A Senior Analyst often directs junior analysts and runs projects, but is still in the weeds and is very much involved in the financial modeling process. FP&A Senior Analyst Salary: $65,000 to $85,000 including bonus. Experience: While undergrads are hired as analysts, MBAs are hired as senior analysts. Similar to the FP&A analyst, accounting backgrounds are preferred. 3-5 years of experience is typical. By this point the FP&A professional has proven his/her worth, has performed numerous analyses and has been a key individual contributor in many planning cycles. FP&A Manager Salary: $85,000 to $115,000 including bonuses. Experience: 5-10 years of experience is typical. Managers are either internally promoted, laterally hired, or brought in from Big 4/other accounting roles. The vast majority of managers will either have an MBA or CPA. Director of FP&A Salary: $100,000 to $250,000 plus stock options and bonuses. Experience/Typical Candidate: 10+ years of experience running corporate planning cycles, implementing new processes and acting as the lead on multiple projects. Transition to the CFO role is obviously rare (there's only 1 spot) but FP&A, alongside the controller and treasury function have been considered potential stepping stones to the CFO position. 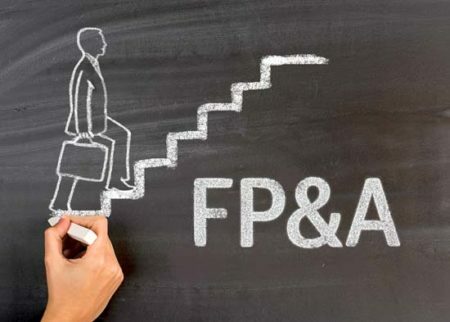 After the Director/VP level, the majority of FP&A professionals tend to stay within FP&A, either in their current organization or at other companies. At large companies, directors can progress internally by taking on responsibility for larger P&Ls. Transition to the CFO role is obviously rare (there's only 1 spot) but FP&A, alongside the controller and treasury function have been considered potential stepping stones to the CFO position. Those seeking this type of transition often look to rotate to other key areas in the organization such as a Controller, Business Development, Corporate Development and Operations. This well-rounded skill set is critical in getting the nod to the CFO position. Even more rare is the opportunity to rise to the CEO level. Due to the highly analytical and inquisitive nature of a person who succeeds in FP&A, many also seek the entrepreneurial route by founding companies in all types of industries. Generally, FP&A professionals enjoy a better work-life balance than those working in investment banking or consulting. Candidates without accounting background will be more competitive by demonstrating an interest in FP&A by gaining a designation such as a CPA, CMA/CFM or FP&A Certification from the Association of Financial Professionals. Those switching careers out of investment banking are less common, although the financial modeling experience gained in IB is looked at positively. Professionals seeking to transition into a senior role in FP&A will need to have significant experience managing various projects and corporate initiatives. If transitioning from consulting or banking, deep industry experience is required. For example, it is very unusual to see a generalist get hired in a senior position at a healthcare organization without experience in the the healthcare industry. Generally, FP&A professionals enjoy a better work-life balance than those working in investment banking or consulting. Hours range from 45-55 hours a week but can spike to 70 hours per week during "fire drills" and seasonal peak times. Public company FP&A teams in particular tend to work longer hours, particularly during the quarterly financial close process, when the work can be grueling and time sensitive. Unlike professional services like investment banking or consulting, there is typically no set time frame or up and out policy.